Democracy in Black was a book I happened to read early this year just in time for the inauguration of 45th US President. 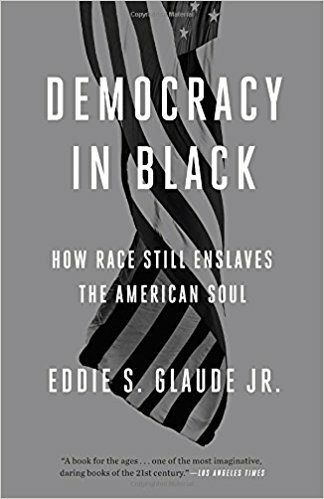 A book recommended for all ages for the Los Angeles Times, bestselling author Eddie S. Glaude Jr. continues the discussion on the promise of equality in America. He capitalized on history, memoir's, call to action as well the still existing gap on the issue. One would think that perhaps the election of Former President Barack Obama has ended or answered the subdivide. Unfortunately as the author wrote racial habits are a particular kind of social habit which I truly agree. I remember on my first tour of Europe backpacking starting from the Netherlands, Germany, Italy, France and the UK. When your young and travelling, the best gift about it is that experience of the different cultures, languages, lifestyles and way of life. Hence, in the process I sort of develop how I would later perceive someone from the countries I had been. I remember staying in a bread and breakfast inn in Tuscany which was owned and managed by a well educated affluent French Ethiopian couple. Then my recollection of a scene in Charing Cross on street gang fighting right next to the hotel I was staying. In all those times looking at Caucasian Europeans to live normal lives with not much high and low memories during my trip. Today living in US metropolitan diverse cities, you get to experience the different paths and cultures when your a tourist to a particular city. There are the permanent communities like Chinatown for example as well as you would hear that a particular community resides in a certain demographic location. For example, the Latinos are concentrated this part of the city, the Chinese are on this part and so. It's not to state the racial subdivide it's just how were accustomed that people with racial origins have their own identified communities where a lot of the original cultures etc.., are concentrated. President Obama when elected was very promising to the African Americans as well the people of colors hope for equality. However, as President as much as he tried to open the discussions on equality he was only able to do as much as after all he represented all the cultures as President. This was the disconnect as people thought of him as the black progressive antidote but with the position of leader of the free world there was just too much risk if he indeed focus on pursuing inequalities faced by people of color. Post Martin Luther King, the civil rights and now post Obama, the race inequality might have gain traction on getting the problem More discussed but the problem still persist. It is a discussion not just for the American Africans but also for any minority and people of color as after all we all live in this great country, we all work, and we all contribute to economy and society.